USP is something that talks about what you have that your competitors don't! Every individual born in this world has certain characteristics and talents. It's this USP of his that defines him and that matters! Everyone is blessed with special talents. In this journey of life, we often bump across people who make their presence felt in our life in a special way. They inspire us through their life. Their life story is no different than a lesson for all of us. UNIQUE is the keyword that distinguishes them from the others. No one imagined that a tea seller would lead a nation one day, a bus conductor would turn into a Superstar or a newspaper boy would grow up to become a scientist. These individuals led their life in such a way that not only teaches great lessons to many but also inspires them. One such story is that of a little boy called Lionel from Rosario. Rosario is a small town in Argentina which is known for its Football Culture. This boy worked hard and harder and one day he scaled great heights that he was known as the Superstar of the Football world. The little boy Lionel was none other than our Lionel Messi. Lionel Andres Messi, the world's most celebrated footballer. He had a great zeal for this sport. And this is what one of his coach from his childhood days said about him. "When you saw him you would think: this kid can't play ball. He's a dwarf; he's too fragile, too small. But immediately you'd realize that he was born different, that he was a phenomenon and that he was going to be something impressive." - Adrian Costa. I have spoken to many kids who say that they want to grow up to become a famous footballer like Messi and score goals for their country. Isn't it an amazing thing to do? Messi has inspired a generation. Like Messi, there is one more thing that has inspired me. It is known as the Messiah of Mumbai, the life line! The Mumbai Local! You might be wondering and even amazed on how a Local train can inspire me. For all of you, it might be just a train that transports passengers from one place to another but for me it is something beyond that. For me, a lifeline of Mumbai can't just be a dead thing after all a lifeline has a life in it. And that's the reason why Mumbai comes to a standstill when the Mumbai local stops. Mumbai local inspires me. Being a huge fan of Messi, I realize that Messi and the Messiah - Mumbai Local, have some great striking similarities. After that, I have jumped to the conclusion that they both are made of great. Messi never fails either Mumbai Local. There have been several instances where the players from the opposite team played foul and tried to topple you down and gain free kicks. Messi is honest. The drawback of being honest is that people tend to take you for granted and throw you down and apply their bad tricks on you. This is applicable to every aspect of life. Messi rarely misses any chances, but he never steals a shot from any player. He never loses his balance, composure and is sincere. Same is with the Mumbai Local. There have been several instances where cases of various terror attacks have rocked the nation. Even during those catastrophic events the life line of Mumbai never stopped. That's why I said that a lifeline has a life! Both teach a valuable lesson to us. There might be events that may bring you down. Be strong and never give up! "I always thought I wanted to play professionally, and I always knew that to do that I’d have to make a lot of sacrifices. I made sacrifices by leaving Argentina, leaving my family to start a new life. I changed my friends, my people. Everything. But everything I did, I did for football, to achieve my dream." - Lionel Messi. Never be afraid of sacrificing something or someone in life for their happiness. After all your sacrifice will eventually bring joy to the life of your loved ones! 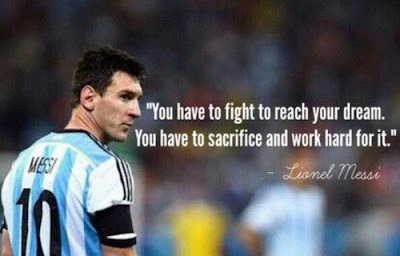 That's what Messi's life teaches us! Messi is one of the best strikers in the football world. He can hurt the defense of any football team and bring it down. That's the specialty about this player. That's why he is said to be the most dangerous player of this generation. It's because he has great powers and abilities that scare the players from the opposition. Similarly, Mumbai Local has some great powers too. It has abilities to run in any weather. Even rains can't affect the Mumbai Local except for some cases. After all there can be some exceptions at times! The local carries a load of 7.5 million people in a day. Isn't that amazing? 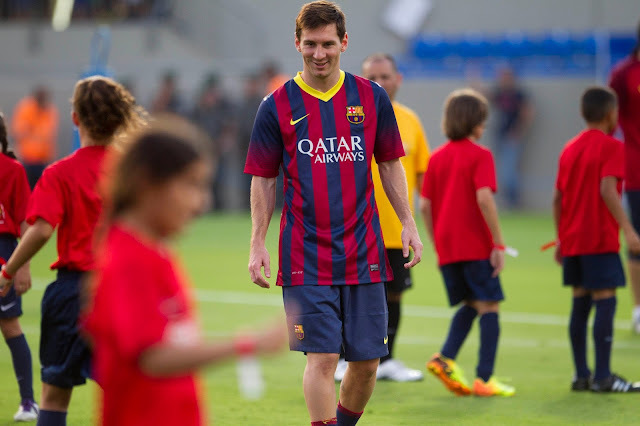 Messi is a short player and a good sprinter. With his short stature, he can dribble the ball and sprint at a great speed. With a great pace, he can change his direction and speed at any moment in the game and that's the reason why the midfielders and the defenders from the opposite team find it difficult to tackle him. Mumbai Local is known for its speed too. This covers the line between Churchgate and Virar! 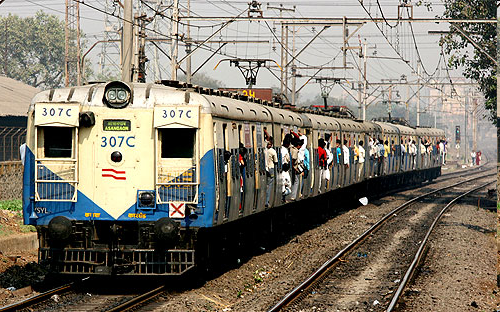 And the fast trains make it easier for people who travel long distances. The train runs at great speed and only halts at important stations. So, people can choose the option of using a Fast train or a Slow train. "It's the fastest mode of travel in the city. Compared to other transport and other travel modes, its the cheapest too. 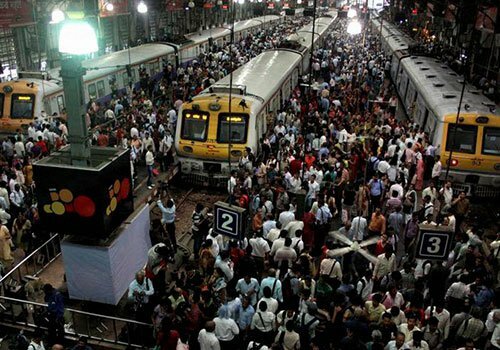 It's the lifeline of Mumbai without which the city would come to a grinding halt" - Sanjay Thampy. Messi is always alert on the field. His sharp eyes are aware of the dangers from the opposition team in form of defenders, midfielders and the strikers who prevent him from scoring the goal. He also easily breaks the man marking that the other teams plots for him in order to prevent him from entering the other area. But still hardly any force can break his spirit for this game. Similarly, Mumbai local acts appropriately in case there are any issues. It halts when there is a train on the same track and waits for it to move! "It's a window to the world. So much can be learnt while observing people go by, even a mundane routine teaches us about hundreds of lives of strangers who walk past us. So different yet so similar" - Divyakshi Gupta. Both Messi and Mumbai local are reliable. In Messi's case, his entire team depends on him and so does the fans. And he never lets them down. That's the best part of the story. Mumbai Local is reliable too. It shortens your travel route. The road distance between two places might be more but if you take the local then the distance would be reduced considerably! Messi plays for the team. He never brags about the number of awards he won or goals he scored. It's hard to see such a humble person in today's era. And then Mumbai local is a team player too. Check out this statement made by my friend Deepika. "Have you seen those crowded trains that go to Karjat and Virar? I have noticed something here. It doesn't matter how crowded these trains are ..people there are always willing to accommodate that one more person who is almost about to miss the train and some other person or another will offer his hand and pull him up to the footboard even when the train is in motion. Respect!" - Deepika Mantri. Well, there are lots of amazing things about the same. Mumbai Local serves as a platform where we make good friends. These people eventually turn out to be the best people of our life. Sometimes even though the train might be over crowded and there might be no room for more passengers, but still some helpful folks standing at the door might try to fit you inside. So much love no! Even though we all are strangers we share our stories with each other. Sometimes through these friends we seek solace. And sometimes we discuss Television soaps too! We play music and sing bhajans inside the Mumbai local. Like we all have college friends, school friends, office friends and building friends, some people also have train friends. And they always catch the same train and the same compartment and sometimes the same seat. Thanks to the Mumbai Local. There can be many things said about both Messi and the Mumbai Local. It's just that both are made of great. One brings joy in the face of fans by scoring goals and other facilitates people by transporting them between places and thus making life easier for them and thereby getting them closer to their goals. That's why it is said that what drives us from within is what makes us great! Messi never looks sideways or backward but always runs forward towards the goal. Similarly, he teaches us to run towards our goal. Our goal is something that matters to us! Mumbai Local takes us closer to our goal as it serves as our travel partner! It is an integral part of our life and people in Mumbai would agree to me. Not everyone who is born in this world is great. Greatness is earned! There are many things and many people in life but only few qualify to be great. Lionel Messi is talent galore with conviction and is an icon for today’s youth. He is a winner who is trustworthy, reliable, pioneering, simple and driven by self-belief, which is what is at the core of Tata Motors as well. Thus, proving to be an ideal fit for the role of Global Brand Ambassador. The way you have compared Messi and Train is commendable. Good to read your introduction of Messi and then a smooth transition into Mumbai Local. The points are very relevant too! an interesting post and interpretation of #madeofgreat that makes me think why did I not think of it before? ;-) Kudos! Brother, what a combination. Point by point comparison of Messi with Mumbai local train. I myself had utilized the service of local train recently and I was lucky to get down at Andheri as the influx of passengers hindered my crusade to get down. I see you haven't asked for the 750/- comment but still you are entitled to impart. My answer to the association of Messi with Tata motors is a smsll one. They are lucky to have him on board. The story of a Legend (afterall the Train performs just like Messi) – that’s how I will describe it in a short sentence. Very well written with words and pics which enhance the simplicity yet greatness of the Locomotive.. Salutations and very happy for you to have got inspired and bringing out your best in life. This is quite an unique post. The way you compared Messi and Mumbai Train, is really good. Liked the quotes you included in the story. All the best for the contest!